M O’Brien Plant Hire takes a professional approach to Plant Hire and assures the construction industry that they are receiving a high quality service. From humble beginnings to offering a top end plant hire experience with high specification and quality guaranteed on any job no matter how large or small. our customers no matter how big or small the Job. 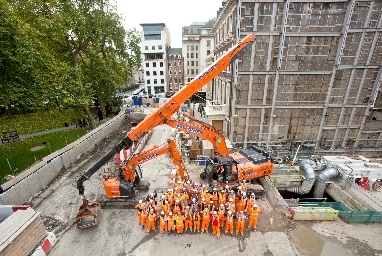 supply a nationwide complete hire solution. conscientiousness to carry out the task to the highest standard. Michael O’Brien was just 19 years old when he first came over to England. He very quickly found work in the UK construction industry, initially starting out as a ground works labourer. As time went by, young Michael got a hankering to operate the machines and blagged his way into the seat during lunch breaks. During these periods he used to practice hard to perfect his skills and in time he was given his own machine to operate. In 1990 Michael decided to have a go at machine ownership, and in conjunction with his wife Annamarie, he formed M O’Brien Plant Hire, which at the time was based in Luton. Michael’s first ever machine was a JCB 3CX, which they ran out of there back garden in the town. 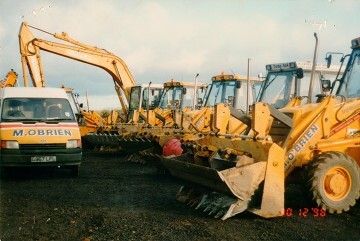 As the business expanded they were eventually running no less than 11 JCB’s – still from their garden! As one can imagine the neighbours soon got fed up with the sound of machines firing up at 5am in the morning and the late night sound of sledgehammers and tools clanging as repairs were carried out in preparation for the next day. It was at that time that the company purchased it’s first yard in Markyate, which is currently being refurbished to house the head office and accounts department. Today the business runs in excess of 400 pieces of equipment, employs 20 office based staff spread between two depots, around 200 plant operators at any one time plus additional supporting plant engineers and yard staff out of their premises near St Albans adjacent to the M1. The business operates not only locally but on a nationwide basis, providing a one stop plant solution to a wide variety of clients including blue-chip company’s such as Balfour Beatty, Skanska, Costain, Carillion, Bam Nuttall, PPS Pipelines, to name but a few.